The hotel’s tireless efforts in the Nigerian hospitality industry continue to be recognised and called out for success by leading players in the tourism and hospitality sector. 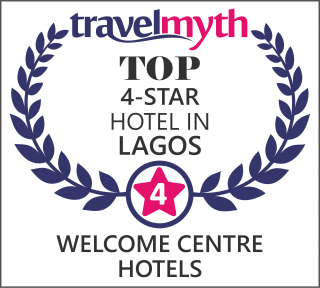 Welcome Centre Hotels has been named Best 4-star Hotel in Lagos by TravelMyth. We thank all our staff, management, vendors and partners who continue to help us make the difference in this competitive and challenging environment. Most of all, we thank all our guests – corporates and individuals – for their continued patronage, support and constructive feedback because without them, all our efforts would be in vain. Communique from TravelMyth “Hello from Travelmyth! According to our hotel search algorithm, Welcome Centre Hotels is now ranked as the top 4-star hotel in Lagos – congratulations! http://www.travelmyth.com/Lagos-LagosIsland/Hotels/four_star” by Teo Vasilopoulou, Travelmyth Content Management Team. Nice, and safe environment. Excellent staff.